Lifestyle is one of the most important factor that can both cause and cure high Blood Pressure. 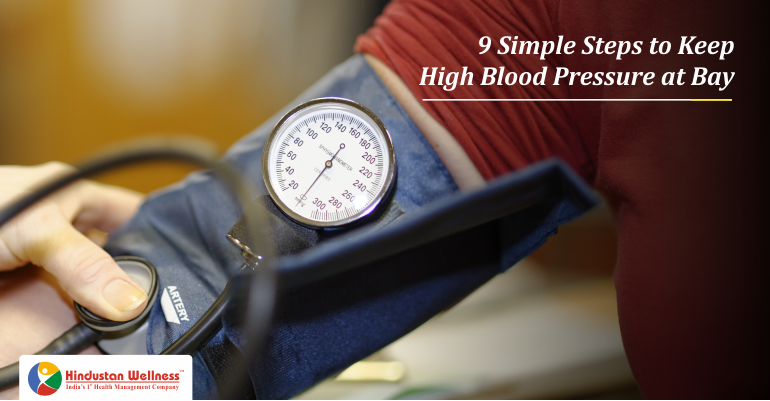 High blood pressure increases the risk of heart attacks and it is very important to keep the BP under control. Regular exercise is the best thing to do in order to reduce high Blood Pressure. Regular exercise strengthens the heart muscles and lowers the pressure in the arteries. 30 minutes of brisk walking every day is all you need to keep your BP under control. If you are very busy, 3 small walking sessions of 10 minutes will also do wonders. Our body needs only 1500 mgs of salt through the day, but modern lifestyle has greatly increased our salt intake due to the presence of excess salt in fried and packaged food. To control your blood pressure reduce intake of salt and also limit the temptation to sprinkle salt over salads and soups. Snack on fruits and nuts instead of package food. According to a statistics around 16% of cases of high BP are related to alcoholism. Drinking alcohol is known to increase your raise blood pressure. So limit your alcohol intake to keep control on your BP. Potassium is a very important nutrient for our body and it also helps in getting rid of excess sodium from our body. Include foods which have high potassium content ; such as banana, beans, milk and yogurt to your regular diet to maintain healthy potassium sodium balance and also keep high BP in check. Reduce your intake of coffee to stay healthy and also control your blood pressure related worries. Eating loads of sugar, sugar rich foods and refined carbs like Maida brings bad news for your health and weight which inturn plays havoc with your blood sugar level. So, reduce intake of these substances to keep a check on your overall health and blood pressure levels. There are some simple home remedies known to lower blood pressure. Eat 1-2 cloves of garlic in the morning to keep check on your blood sugar level. Your kitchen is your first line of defence against all lifestyle diseases, so weed out unhealthy foods and replace them with loads of fresh fruits and vegetables and see the change in your life. If you have any query related to Diabetes Health Checkup, you can please contact Hindustan Wellness. Our representatives are waiting eagerly to entertain all your queries.